This skin adds fearsome-looking shoulder spikes and stylish blue accent lighting to the Sandstorm MonstroBot. The bot has been branded with the King's official tournament seal, allowing a hunter to show off their tournament skill! The MonstroBot Champion Skin can be used on the Sandstorm MonstroBot. The trap's stats (power, power bonus, attraction bonus, etc.) are not changed. The MonstroBot Champion Skin can be purchased in the Tournament Hall Trapsmith in exchange for 45 Tournament Tokens. The MonstroBot Champion Skin cannot be traded on the Marketplace or through Give To Friends. 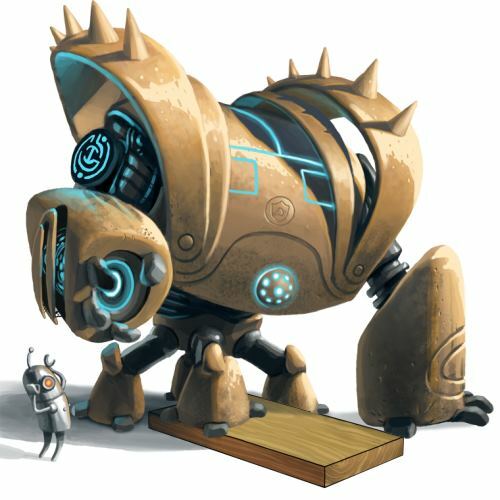 12 January 2012: The MonstroBot Champion Skin was introduced with the opening of the Tournament Hall. This page was last edited on 9 December 2017, at 14:13.